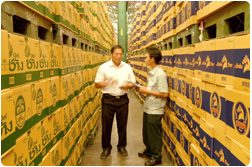 The company is the sale representative for Beer Chang and all Chang beverages produced at the Beer Thai (1991) Plc. brewery in Klong Klung District, Kamphaeng Phet Province. The company is the sale representative for Beer Chang and all Chang beverages produced at the Beer Thip Brewery (1991) Co., Ltd. in Bang Baan District, Phra Nakhon Sri Ayutthaya Province. The company is the sale representative of liquor products from five distilleries of Sangsom Co., Ltd. , Fuengfuanant Co., Ltd. , Mongkolsamai Co., Ltd. , Thanapakdi Co., Ltd., and Kanchanasingkorn Co., Ltd. The company is the sale representative of liquor products from five distilleries of Sura Bangyikhan Co., Ltd., Athimart Co., Ltd., S.S. Karnsura Co., Ltd., Kankwan Co., Ltd., and Thep arunothai Co., Ltd. The company is the sale representative of liquor products from five distilleries of Red Bull Distillery (1988) Co., Ltd., United Winery and Distillery Co., Ltd., Simathurakij Co., Ltd., Nateechai Co., Ltd., and Luckchai Liquor Trading Co., Ltd.